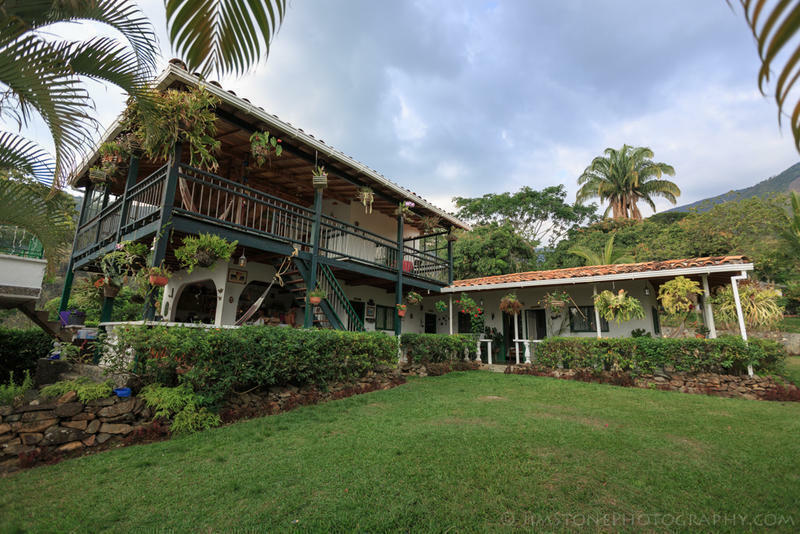 The Hostal La Finca Culturas Unidas has, besides the gorgeous views, a big pool, big garden with fruit trees and vegetables, hammocks, restaurant service, kitchen, bbq, bar, dvd, library and books exchange. Our staff speaks English, Spanish and German. We also have free wi-fi and localcalls. You can come here by yourself, with a friend or partner and relax and enjoy nature and our activities or get a group together, rent the whole place and have a finca-fiesta-weekend! We have 2 dorms with a shared bathroom and 3 private rooms with private bathrooms, mostly renovated but still in a typical finca-style. We offer different options including meals, guided hikes, waterfall excursions, day trips to Santa Fé and much more. take a bus to San Jerónimo, they leave approx. every 30 min, costs are 7.000 - 13.000COP/4 – 8USD (depending on the company and size of the bus), it takes about 1h. From San Jerónimo take a mototaxi (25.000 - 30.000COP / 14 – 17USD, max. 3 persons) or a motorbike (10.000 - 15.000COP / 5.50 – 8.50USD) up the mountain, 20-30 min. 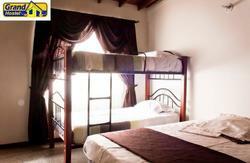 For groups up to 10 persons or if you have a lot of luggage you can take a jeep for 40.000COP / 22.50USD. If you give us notice in advance we can arrange the transportation from San Jerónimo, or even Medellin & Airport for you.On Mon - Fri, if it´s not a holiday or during vacations the school truck brings students from San Jerónimo to “Los Cedros” every afternoon at 2.30 pm from the “Calle del Comercio” in front of “Hipertienda Romo”. Be there early to make sure you get a seat as it does get crowded. Get off at “Rancho San Sebastian / Hostal La Finca”, right before “La Mencha”. Cost is 3.000COP / 1.70USD. leaves to Los Cedros. On Sundays at noon and 5pm. Cost is 3.000COP/1.70USD. As well as the school truck it leaves at “Calle del Comercio” a bit further down than the school truck; it´s big - you won’t miss it. 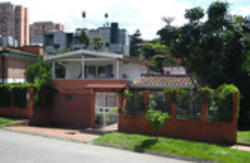 Get off at “Rancho San Sebastian / Hostal La Finca”, right before “La Mencha”. little store at a junction. From there take a left and walk for about 15 min. until you find our white gate on the left-hand side. These public means of transportation are definitely the cheapest way to get here - they might be slow, a bit uncomfortable and sometimes unreliable but always a great way to experience a little piece of the daily life of the locals. off at the 'Terminal del Norte' (best ask the driver to tell you when you're there as it's just a stop along the road. If you keep going to the final stop, you'll get into the city center of Medellin from where you can take a metro from the station 'Parque Berrio' to 'Caribe'. 'Caribe' is the metro station at the 'Terminal del Norte' and connected through a bridge directly to it. From there see directions above. Another option from the airport is to take a cab (57.000 per cab) and tell the driver to get you to the Terminal del Norte. From there see directions above. Take the I 62 towards the west and Santa Fe, Antioquia. You will pass the longest tunnel in South America the 'Tunel del Occidente' which is 4.6 km long. After about an hr in total you will reach the entrance of San Jerónimo which lies to the right-hand side of the road. Turn right just in front of the Texaco gas station and just past the 'Exito' supermarket. At the next fork turn left, next fork left again, cross the bridge, at the next fork turn left again. On your left-hand side there will be a number of wooden fruit stalls at the side of the road, at the right-hand side you'll see a dirt road with a big white sign saying 'Los caminos del café'.